These are the main properties that either belonged to or were leased by members of the Gorwyn and Lambert Gorwyn family at some time during its history. In each parish they are listed in alphabetical order. Until the 18th century, only a few farms belonged to “freeholders” or the people who farmed them (Gorwyn was one of these). Most farms belonged to large landowners, originally the owners of the Manors in which the farms lay. These farms were let out on so-called 99-year leases “determinable” on a number of “lives”. Under this system, the tenant farmer named up to three people on the leasehold document, usually himself and his children, and the lease lasted for 99 years or until all the named people had died if that was sooner (as it invariably was). The farmer normally paid a substantial upfront sum for the lease and then a small annual rent thereafter. Often he also had to supply the landlord with a capon at Christmas. When one of the “lives” or named people died, the tenant had also to pay a “heriot” of his “best beast” or an agreed monetary sum in lieu. He could however renegotiate the lease at this point and add extra lives to it, on payment of an extra up-front sum. In this way, leases could continue indefinitely, and many tenanted farms remained in the same family for generation after generation, giving farming families a good degree of security. Sometimes the richer farming families would hold several leaseholds and would sublet some of the farms for extra income. The system of 99-year leases determinable on lives lasted until the 19th century, when fixed term leases or leases by the year became common. The basic size of viable farms since medieval times was 40-70 acres. Many of the farms in this part of Devon, however, had a lot of unusable land – heath, moor and bog – and to make a good living a farm of 100 acres or more was often needed. Many of the farms had labourer’s cottages attached to them. Most farms were already in existence by the end of the 13th century and some date back earlier than that, in some cases to Saxon or even Celtic times. Most of the current farmhouses were built in the 15th, 16th or 17th centuries, replacing earlier more humble ones as farmers grew wealthy from the wool trade. Many of the houses have been substantially altered since then, but their earlier core is usually still very visible. The farmhouses were large, often with half a dozen bedrooms and many have now been listed by English Heritage as historical monuments. They were mainly built of cob and thatch, although those nearer Dartmoor are often partly or wholly of stone. Farm boundaries were, like the boundaries between manors, fairly fluid at the edges as farmers bought and sold fields (or even lost or won them at cards from their neighbours). But the overall shape of most farms remained unchanged until the last part of the 20th century. Increasingly the farmhouses, perhaps with a paddock or two, were sold to prosperous incomers who commuted to work in one of the local towns. The fields were then acquired by neighbouring farmers who added them to their own farm. So it is now quite difficult to trace the old boundaries without recourse to historical documents, including especially the mid-19th century tithe maps. At the time of the Domesday Book, the area covered today by the parish of Cheriton Bishop was divided into a number of manors, each granted by William I to different people. The boundaries between manors were pretty fluid, as holders of individual manors often bought property in neighbouring ones. While the person holding the manor usually owned most of the properties in the manor, in some manors there were also properties like Gorwyn that were effectively freehold, although the owner usually had to pay a small annual sum in lieu of service to the lord of the manor. Cheriton, which subsequently passed to the Abbey of Tewkesbury, from whom it was confiscated by Henry VIII. It seems then to have been sold in parcels, mainly to the Fulford family of Great Fulford in neighbouring Dunsford, and ceased to exist as a manor. But Coxland must once have been part of it. Eggbeer, which remained for a long time in the hands of the Kelly family, probably the descendants of the Norman follower of William the Conqueror to whom he originally granted it after confiscating it from its Saxon owner. It then (in the 1500s) seems to have been purchased by the Fulfords, who are probably still technically its Lords. Gorwyn was in Eggbeer, but seems to have been from fairly early times a freehold not owned by the Lord of the Manor. Medland, which passed in medieval times into the hands of the Abbey of Tewkesbury, from whom it was confiscated by Henry VIII. It was purchased by the Davy family in the 1500s, and they remained the owners until 1814, when their estate was sold and Medland Manor was briefly acquired by George Lambert Gorwyn. Lampford, which was acquired early on by the Fulfords through marriage. Little Lampford (in which Lambert lies), which seems to have been split between several owners at an early stage. Part of it was acquired by the Fulfords and was probably subsumed into the big Manor of Lampford. Confusingly, it is usually known as plain Lampford, so when it is mentioned in documents it is difficult to distinguish it from the big manor of Lampford. It was the Manor of Little Lampford that John Lambert Gorwyn acquired in 1800 and sold on to his uncle George Cann of Spreyton, who bequeathed it to George Lambert Gorwyn of Spreyton. As the above indicates, by the end of the 16th century, Cheriton Bishop had two big landowners, the (resident) Davys and the (non-resident) Fulfords, although there were also a number of freehold properties. The Fulfords ran into debt in the later part of the 18th century, and sold several of the farms that they owned at that time. The Lambert Gorwyns (who were already renting some of these farms) were the main purchasers. The following are the farms and other properties in Cheriton Bishop that were owned or rented by members of the family at some time. BOWDEN, Parish of Cheriton Bishop; Manor of Lampford. Also known as North Bowden. First recorded mention 1332. A small to medium-sized farm close to Lambert, probably at one time about 70 acres, although most of the land has now been detached from the house. The small farmhouse still has its medieval core. Bowden is a common Devon farm name (there is, for instance, also a Bowden in Drewsteignton); the first part of the name probably means curved like a bow, perhaps after the curved hill behind the house. By the mid-1600s, it belonged to the Fulford family and was part of their manor of Lampford. The leasehold of Bowden was held by the Gorwyn family for several generations before they purchased the freehold. 1651: mentioned in the will of John Gorwyn, who bequeathed the leasehold of Bowden to one of his sons. He owned or rented other farms nearby and it is not clear whether he or his son actually lived at Bowden. 1707: the will of John Bowden of London refers to his cousin “John Gorwyn of Bowden”, presumably a descendant of the earlier John, so by that time there were definitely Gorwyns living there. 1737 Francis Fulford granted a 99-year lease to Richard Gorwyn of Drewsteignton (1693-1764 (presumably a renewal of an earlier lease) for 7/6d a year and a heriot of £4. 1764: the leasehold passed on Richard’s death to his son John Lambert alias Gorwyn of Lambert (1719-1765), and then on John’s death to his widow Mary. 1771: Mary Lambert Gorwyn purchased the freehold of North Bowden from the Fulfords for £430, although the sale agreement specified that the owners of Bowden had to pay a “reserved” annual rent of 1s. to the Fulfords in perpetuity. Bowden then passed to her son William Lambert Gorwyn of Wallon in Drewsteignton (1750-1797). William, like his father and grandfather, appears either to have let or sublet the farm, or to have farmed the land and used the house to accommodate farmworkers. The census indicates that during most of the 19th century the house was divided into two cottages and occupied by agricultural labourers and their families. 1890: the descendants of William Lambert Gorwyn sold the property. First recorded mention: 1333). This farm, very close to the church of Cheriton Bishop, probably took its name from the Cok family – an Elena Cok was mentioned in the 14th century lay subsidy rolls. The farmhouse was originally a traditional Devon longhouse, added to during the centuries, and is exceptionally large. about 1850: acquired, probably as a freehold, by or for John Lambert Gorwyn (1828-1893), the young son of William Gorwyn of Bradleigh. At the time of the 1851 census, when he was only 22, John was living there with his mother, farming 270 acres, so it was a large farm (although that acreage probably included Spirelake as well). John subsequently married and brought up a huge family there. 1893: after John’s death Coxland passed to one of his younger sons, Arthur Lambert-Gorwyn. Arthur, a bachelor, continued farming there until his own death in 1952, the last member of the Gorwyn family to farm in Cheriton Bishop. The farm then passed out of the family. Crockernwell is a hamlet on what was the main Exeter-Okehampton road (or “Great Turnpike Road”) before the building of the modern dual carriageway. It straddles the Cheriton Bishop-Drewsteignton border. In the 18th century the Golden Lion was a well-frequented coaching inn where people changed horses at the half-way point between Exeter and Okehampton. In the 1700s, it belonged to the Fulford family of Great Fulford. 1899: the Golden Lion was sold to George Cann of Spreyton. The sale notice described it as consisting of “a kitchen, 2 parlours, cellars, brewhouse, 2 stables and a curtilege with a garden and 3 little plots of orchard, the whole about 2 ¾ acres”. 1804: George Cann died, bequeathing the inn to his niece Elizabeth Lambert Gorwyn (1752-1819). Although the inn was tenanted at the time of George’s death, she appears to have taken it over herself, as she is recorded as the licensee from 1804 to 1809. It was during her tenure that Lieutenant Lapotiere changed horses there while on his way by post-chaise from Falmouth to London with the news of Nelson’s victory at Trafalgar. 1819: Elizabeth died, leaving the residue of her estate, presumably including the inn, to her niece Elizabeth Arden. But at some stage the Golden Lion seems to have been acquired by Elizabeth Lambert Gorwyn’s youngest brother George, as in his 1837 will George left the inn, together with its accompanying land, orchard and garden, to his housekeeper Elizabeth Langdon. 1837: Elizabeth and then William Langdon, presumably her son, took over the inn and William remained there at least until 1861 (he is said to be the author of the Widdecombe Fair ballad). By the end of the 19th century, with the advent of the railways, the inn was no longer viable and ceased business. One of the stables of the Golden Lion remains intact. GORWYN, Parish of Cheriton Bishop, Manor of Eggbeer. Also spelt Gorefenne in 1288; Gorfenne in 1322; Gorven or Gorfen in 1635; Gorven alias Gorwin in 1696, and also in subsequent centuries as Gorin; Goring; Gorrin; and Gorring. The pronunciation until the early 20th century was “Gorren”. The name means ‘muddy fen’. It may have been the Rook’s Fen mentioned in an Anglo-Saxon charter of 976. The farm that gave its name to the Gorwyn family, and where the family (or a branch of it) lived until the mid-1600s. The cob and thatch house was built in the mid-1400s (when the family were probably doing well as a result of the wool trade. It was a typical Devon long-house. The family would have lived in one end of the building in a medieval hall with the fireplace in the centre (the smoke-blackened beams from that central fire are still there), with the animals being housed in the other end of the building. Two wings (including one with a kitchen) were built in the mid-1500s and 1600s, and at that stage the animals were probably moved out into outhouses. The house is listed as a Grade II* ancient monument, and Pevsner comments that it must once have been a superior medieval house. It is no longer a farm. 1288: Richard Gorfenne was recorded as living there (in a case before the Assizes). 1332: William Gorefenne paid tax in the tything of Eggbeer (which included Gorwyn). 1524: an inquisition post-mortem recorded that it was the property of Thomas Gorfen who died in that year, leaving it to his son William. At that time it was described as “four messuages” [i.e. dwellings] and divers lands and tenements, meadows, woods, pools, pastures and pasture-lands”, worth 35s per annum. 1635, John Gorven and his wife Mary were living there, according to a Chancery case. 1776: Gorwyn (as it was by then spelt) belonged to the Davy family of Medland Manor. They were paying a chief (ie manorial or reserved) rent of 4s to the Fulfords of Great Fulford. The Davys let it out to tenant farmers. 1814: Gorwyn was sold at auction along with the rest of the Medland Manor estate and purchased by George Lambert Gorwyn of Spreyton (1763-1837) for £2,200. At that time it consisted of 117 acres. 1824: George Lambert Gorwyn sold the property and it passed into the hands of Seth Hyde, a prosperous Exeter merchant, and then by descent through his daughter to George Bryce Pennell, who was recorded as the owner in 1879. The Hydes and Pennells let the farm to a succession of tenants. From 1843 until some time in the 1860s the tenant was John Gorwyn (b. 1813), a descendant of its original owners. At that time, the farm consisted of 130 acres. He was the last member of the family to live in the ancestral home. A farm that appears to have been a freehold from fairly early on. The name means “hollow”. A house, considerably altered in the 19th century, still survives; this may, however, be a cottage that used to belong to the farm rather than the original farmhouse. In 1785, the owner of Hole was John Frost, and sometime after that it appears to have been acquired by William Gorwyn (1750-1817), the second son of John Gorwyn alias Lambert of Bradleigh. 1817: William Gorwyn bequeathed the freehold (along with that of Hole Mills and ?Hearth, valued together at £1987) to his son John Gorwyn 91783-1854). John lived there for many years with his brother Joseph Gorwyn (c.1787-1871); both were unmarried. In 1841 they are recorded as having three servants and three apprentices living on the premises, so it appears to have been a successful farm (at 186 acres in 1842 it was a reasonable size; it included a cottage called Holewell Cottage). 1854: on John’s death the farm passed to Joseph, who went on living there until his own death in 1871. By that time, however, he appears to have handed the farm over to the Haydon family, as in the 1871 census the head of household is a Haydon and Joseph is described as a “lodger”. The Haydons had married into the Gorwyn family and were cousins of Joseph, and no doubt there was some sort of family arrangement to look after Joseph in his old age. The Haydons were there until at least 1881, but by 1889 it was being farmed by William Blanchford. First recorded mention 1330. Not to be confused with the farm of the same name in Drewsteignton. Possible meaning: honey farm. It was a small-to-medium-sized farm – it is described in the late 1700s as “a good farm, houses, 2 barns, shippen, linhays” with 76 acres of land. It was part of the big Manor of Lampford that belonged to the Fulfords of Great Fulford in Dunsford. 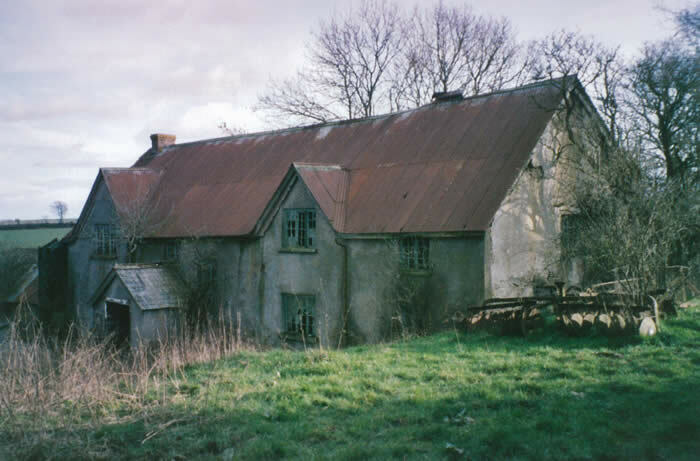 The farmhouse (which was close to the A30 dual-carriageway) was abandoned in the mid-20th century and all that remains of the buildings are some dissolving cob walls covered in brambles. 1811: the Fulfords sold the freehold of Honeyford to John Lambert Gorwyn of Lambert (1746-1823), a rich bachelor, for £200. The deed of that sale noted that it was subject to a 14-year lease to John Bolt for £48 a year that begun in 1800.
c.1813: William Gorwyn (1780-1845) of the Bradleigh family of Gorwyns took a leasehold of Honeyford and moved there with his family. In 1821 he was living there with his wife, seven children and three apprentices. He then inherited the much larger farm of Bradleigh in Crediton Hamlets and moved there, although he seems to have kept the leasehold of Honeyford at least until 1828. 1823: John Lambert Gorwyn of Lambert died, leaving the freehold of Honeyford to his nephew John Arden Gorwyn. The latter appears at first to have taken the farm in hand himself (although it is doubtful whether he ever lived there; he was at Ford in Drewsteignton at the relevant time and then moved to Somerset). But by 1841 the farm was let. Sometime in the 1850s: the farm passed to Daniel Pitts, who farmed there with his sons John and William. The Pitts were rich yeoman farmers from Drewsteignton who subsequently married into the Lambert-Gorwyn family. They remained at Honeyford until well into the 20th century, but then moved elsewhere in the parish. Also spelt Lampford, Lamford and Lamsford. Probably means “lambs’ ford”, i.e. a ford shallow enough for lambs to cross. The farmhouse does not appear to have been part of the big Manor of Lambert that was inherited by the Fulfords in the 1300s, but part of a smaller neighbouring Manor of the same name that, according to the Domesday Book belonged in 1066 to a Saxon called Leuegar and in 1086 to a Norman called Osbern de Salceid. In the 13th century the Manor (or part of it) appears to have been granted to the Prior of Plympton. After the Reformation and the confiscation of monastery lands it appears to have been split up and paert of it acquired by the Fulford family of Dunsford. The early history of the farmhouse (sometimes called Manor House) called Lambert is not clear. The present building dates back to medieval times with substantial additions under the Tudors (possibly built by the Lambert Gorwyns when they acquired it). It may have been built originally for the Prior of Plympton’s bailiff who ran the manor on the monastery’s behalf. It is described by Pevsner as “a large and important farmhouse showing Devon vernacular at its 15th to 17th century best”. It has a number of interesting ancient architectural features, including much oak panelling, and is listed as a Grade II* ancient monument. But it has been substantially remodelled in recent times and it is not that easy now to imagine how it was originally. It is situated at the end of a long lane, the unmarked entrance to which is on the north side of the hamlet of Crockernwell (on the old main A30 road from Exeter to Okehampton). It was once in the middle of unspoilt countryside. But the 20th century rerouting of the A30 means that the farmhouse and its outbuildings (converted into residences) are now near to a noisy dual carriageway. 1567: half of a tenement called Lampford that was held by John Gorven for his lifetime from John Fulford, knight and lord of Lampford. He applied to have the reversion passed to his sons William Gorvan and Richard Gorvan for the term of the longest living of them, subject to the customs of the manor. A fine of £10 was paid to have them admitted and to pass his holding to his sons. 1590: William Gorwyne purchased the freehold from the Beaumont family (a big landowning family based at Gittisham) and also acquired what was described as a half-share of the property from the Fulfords at around the same time – so it is probable that the freehold was jointly owned by those two families. 1635: an inquisition after the death of William Gorwyn (probably the son of the previous one) confirmed that he owned Lambert and his heir was John Gorwyn. 1644: John Gorwin alias Lampford was recorded as paying manorial rent in the Manor of Lampford, and probably lived at Lambert. 1656-7: Alice Gorwyn, probably John’s widow, paid church rate for Lambert. It seems likely, however, that ownership of the property had passed to her son William Gorwyn, although she was treated as head of the household. William had three sons and three daughters, and on his death the property passed to his eldest son John. The latter, however, let the property to his brother William Gorwyn alias Lambert, who lived there with his wife Elizabeth. 1712: After the death of John and William, neither leaving any children, Lambert passed to their youngest brother, George Gorwyn. c.1716: George died, bequeathing bequeathed a 21-year lease of the property to a friend called Robert Moalle. But the freehold, according to the custom of the time, was inherited by his three sisters in equal shares. One sister bequeathed her share to her cousin John Gorwyn, and he and his heirs eventually acquired other two shares. c1740: at the end of the lease to Robert Moalle, the farm came into the possession of Richard Gorwyn of Drewsteignton (1693-1764), who appears to have put his son John Lambert Gorwyn (1719-1765) into the property. He and his wife Mary brought up nine children there. 1765: after John’s death, lambert went to his eldest son John Lambert Gorwyn (1746-1823). He lived there with his mother until her death in 1797: they had a legal dispute with the heirs of one of the three sisters over ownership of Lambert, but appear finally to have acquired the whole of the freehold. John, a bachelor, was a prosperous farmer who owned a lot of land round about. In 1821 he was living at Lambert with no fewer than seven apprentices. 1823: John Lambert Gorwyn died, the last Lambert Gorwyn to live at Lambert. In his will, he directed that timber growing in the piece of land called Woody next to “Lampford Manor House” should not be coppiced, as his will was that the timber should stand and grow there forever. He bequeathed Lambert, together with most of the rest of his substantial estate, to his nephew William Lambert Gorwyn of Wallon in Drewsteignton (1780-1853), also a wealthy farmer aspiring to be gentry. William stayed at Wallon but seems to have taken the farm in hand, possibly putting his bailiff or “hind” in the house (unfortunately the relevant page of the 1841 census is illegible, but in 1851 the occupants were John Phillips, hind, and family). 1853 William died, leaving his considerable property, including Lambert, to his son William Lambert (1810-1887). But William junior had deserted farming to become a solicitor in Exeter, and let Lambert to a farmer called James Wrayford, who lived and farmed there until at least 1891. 1890: the children of William junior sold the freehold of Lambert. Medland is the name both of a Domesday Book manor and of the manor-house and main farm on the manor. The name means “middle land” probably because it was between the land given to Crediton by King Aethelweard of Wessex to the Church in the 8th century and another tract of land called “Hyple’s old land” that was granted by another Saxon monarch to one of his followers in the 10th century. The manor was acquired by Lawrence Davy, a rich merchant from Crediton, in the reign of Bloody Mary. Lawrence and his descendants settled in Cheriton Bishop and became the most important landowners in the parish. The last of the Davys, who died in 1722, bequeathed it to a man called William Foulkes (who adopted the name Davy). The Davy Foulkes family rebuilt the manor-house in the late 1700s, replacing what was probably a traditional cob and thatch long-house by a grander structure. This was described, when the property was put up for sale in 1814, as a “Modern, Substantial, Well-Built Mansion with offices of every description and fit for the reception of a large family, with lawns, shrubberies,” etc, etc. This house was itself replaced by the present red-brick building in the later 1800s. 1824, perhaps because of financial difficulties, George Lambert Gorwyn sold Medland again and it passed into the hands of a prosperous Exeter merchant called Seth Hyde, whose descendants the Pennells remained there until the last part of the 19th century. During most of their tenure the property was let. 1840s: Medland was let to George Gorwyn (1784-1862), a younger son of the Bradleigh branch of the Lambert Gorwyns. He and then his sons George and William remained there until at least 1881. Presumably at one time a local flour or fulling mill. In 1621 it was acquired by the Tuckfield family, big landowners in Crediton, who let it to the Bragg family of yeoman farmers , who continued to be the tenants for several generations. 1792 or earlier: George Gorwyn (1757-1825), a younger son of John Gorwyn alias Lambert of Bradleigh, took a lease of Mill. He remained there with his family until his death. According to the census, in 1821 he was living there with 3 adult children, 1 servant, 2 apprentices and one “inmate” (i.e. a lodger of some kind). 1825: George Gorwyn bequeathed his leasehold interest in the property to his son George, but George died only two years later in 1827. The Gorwyns then seem to have given up the lease, as by 1829 the occupant was Mary Leach. First recorded mention in 1302; Montesdone (1313); Montesdon (1330). Its meaning is unclear; the first part may be a personal name; the second part is a Saxon word for hill. The property seems to have been split into two or three parts (Higher or Upper, Middle and Lower or Little Mounson) fairly early on. Higher Mounson (186 acres in 1814) was the largest. Lower Mounson was only 44 acres and Middle Mounson appears to have been even smaller. All three parts were part of the Medland estate owned by the Davy and Davy Foulkes family. The house at Upper Mounson burnt down in the early 20th century and was replaced by the present building. 1785 or earlier: Higher and Middle Mounson were being rented by the Lambert Gorwyn family of Lambert. The leases were no doubt arranged by the matriarch of the family, Mary Lambert Gorwyn (who died in 1797). The farms seem to have been allocated first to her third son William Lambert Gorwyn of Wallon (1750-1797), but then went to her youngest son George Lambert Gorwyn of Spreyton (1763-1837), as he was the tenant in 1814, although he did not live there. 1814: when the Medland estate was auctioned, George acquired the freehold of all three Mounsons. He then sold them again 10 years later to Seth Hyde, a prosperous merchant from Exeter. A smallholding also known as Fulford Parks and Perries in the hamlet of Crockernwell. Presumably called after an owner or occupier named Newton (a family called Newton is recorded in Cheriton Bishop from 1640 onwards). Part of the Manor of Lampford owned by the Fulfords of Great Fulford. 1770: the Fulfords sold the property (then 10 acres), along with North Bowden, to Mary Lambert Gorwyn, the widow of John Lambert Gorwyn of Lambert (1719-1765), although under the deed of sale she continued to pay a small manorial or reserved rent to the Fulfords for the two properties. She appears to have transferred the property to her second son Richard, and after his early death it went to his infant son John Richard Lambert Gorwyn. 1809: after John Richard’s death there was a dispute over the ownership between two of his uncles, John Lambert Gorwyn of Lambert (1746-1823) and George Lambert Gorwyn of Spreyton (1763-1837). John, who died in 1823, bequeathed it in his will to his nephew John Lambert Arden, but George claimed that it was not his to leave. George appears to have won (or bought John Lambert Arden out), as it was one of the properties mentioned in his (George’s) will. The Lambert Gorwyns appear to have farmed the land (which adjoined other property of theirs) and to have used the house to accommodate their farmworkers. 1837: George Lambert Gorwyn bequeathed Newtons to his grandson son Richard Lambert Gorwyn (1820-1861), along with a lot of other property. c. 1871: Richard’s children sold the property along with the rest of his estate. The name probably comes from the Old English “spir” (rushes) plus “lake” (streamlet). It has now disappeared, but was a smallish farm (about 60 acres) half-way between Cheriton Cross and Crockernwell, to the north of the road. The lane leading to it, on the Cheriton Cross side of Sunny Cottage, is still there, and its site can be seen at the bottom of the lane, in a most attractive sheltered hollow. It belonged to the Fulfords, as part of the big Manor of Lampford, although curiously the owners of the smaller Manor of Lampford also claimed an annual “high rent” of 2s. a year from the occupant of the farm (it was probably on the border between the two Manors and the smaller Manor may have sold it to the larger one). 1740: Francis Fulford granted a 99-year lease to John Gorwyn of Bradleigh in Crediton (1720-1778) for a yearly rent of 7s; a fat capon or 2s. at Christmas; and his “best beast” or £2 as a heriot. This could have been the renewal of an earlier tenancy. 1768: John Gorwyn purchased the freehold from the Fulfords for £220, although subject to a continued reserved rent of 1s. payable to the Fulfords in perpetuity. 1824: William Lambert Gorwyn the younger inherited the larger farm of Bradleigh fronm his uncle and moved there. He kept on Spirelake, farming the land. 1851 or earlier: Spirelake passed into the hands of William’s youngest son, John Lambert Gorwyn of Coxland (1828-1893). The latter appears to have incorporated the land into Coxland and to have used the house for his employees – by 1851 there were two farm labourers and their families crammed into the dwelling. Spirelake probably descended with Coxland to John’s son Arthur Lambert-Gorwyn (1873-1952). By 1891the house at Spirelake was being described as “Spirelake Cottage” and by 1901 census it was unoccupied, so it may have fallen into a ruinous condition. First recorded mention 1275. It means hill (don) of the herd of horses (stod as in stud). It is mentioned in various medieval documents, and was probably one of those properties that was not part of a big manor but belonged to freeholders. It was a smallish farm (79 acres in 1842). In the early 18th century the occupant appears to have been John Strong (a well-known local yeoman family). 1780 or earlier: Richard Lambert Gorwyn (1748-1791), the second son of John Lambert Gorwyn of Lambert, was listed as the occupier. It may have been purchased for him by his parents as he was not in line for Lambert. 1791: when Richard died ownership of the property appears to have passed first to his mother Mary Lambert Gorwyn and then his older brother John Lambert Gorwyn of Lambert the younger (1746-1823). 1823: John Lambert Gorwyn died, bequeathing Staddon to his nephew John Lambert Arden provided that he added Gorwyn to his name (which he did). However, he then appears to have sold the farm to his brother Christopher Arden, as he was listed as the owner in 1842. He let the farm. A good-sized farm (some 150 acres in 1842). It seems to have had several owners before becoming part of the big Medland Manor estate owned by the Davy family and Davy Foulkes family. 1461: Thomas Kyngwill of Thorn was granted the property by John Borne and John Eggbear. The deed was witnessed by John Gorven. 1814: when the Medland estate was sold at auction, Thorn was one of the properties purchased by George Lambert Gorwyn of Spreyton (1763-1837); he paid £2000 for it, so it was obviously considered a productive farm. 1824: George resold the property, and it passed into the hands of Seth Hyde, a prosperous merchant from Exeter, in whose family it remained until the late 19th century. This smallholding in Crockernwell was named after an early owner – there is a court case involving a Nicholas Touker of Crockernwell in the 15th century. By the 19th century it consisted of four houses and a garden. 1802: sold by its then owners for £200 to George Cann of Falkedon and John Gorwyn of Bradleigh, for the benefit of a minor, John Richard Lambert Gorwyn (1791-1801), whose uncles and trustees they were. 1809: after John Richard Lambert Gorwyn died, the property passed to his uncle and heir-at-law John Lambert Gorwyn of Lambert. But it was technically still in the hands of the remaining trustee, John Gorwyn of Bradleigh, and in 1810 John Gorwyn formally conveyed the property to John Lambert Gorwyn for a token 10s. 1823: John Lambert Gorwyn bequeathed Tucker’s Tenement to his nephew John Arden Gorwyn. 1827: George Lambert Gorwyn (1763-1837), another uncle of John Richard, began legal proceedings claiming that Tucker’s Tenement was his, as he was John Richard’s heir under the latter’s will, on the basis that the property was purchased from his trust funds and could not therefore be regarded as part of the freehold property that went by law to John lambert Gorwyn, the eldest of his uncles. George appears either to have won the case or purchased the property. 1837: George Lambert Gorwyn bequeathed the property to his grandson Richard Lambert Gorwyn (1820-1861). It was sold in 1871/2 along with the rest of Richard’s estate by his heirs. First recorded in 1281. In the past the name was more often spelt spelt Bradley, Bradeley, Bradelegh or Bradlegh. The farm is in the far south-west of the parish of Crediton (which has a large rural hinterland), bordering on the parish of Cheriton Bishop. Cheriton Bishop is actually nearer to the farm than Crediton, and its occupants mostly treated Cheriton Bishop as their parish. The name means ‘wide clearing’. It is quite a common Devon farm name. There is another property of the same name (now spelt Bradley) in the far north-east of the parish of Crediton. Unfortunately, in old documents it is not always possible to tell which Bradleigh is meant, which makes the history of the house a bit difficult to determine. The farm seems always to have been a large one (in 1842 it was 228 acres), but is very steep. The house is on a ridge with glorious views. 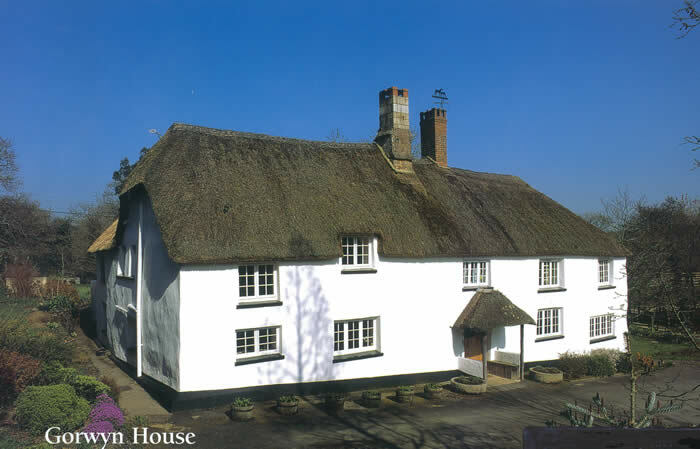 It was a traditional cob and thatch long-house that was improved by the Lambert Gorwyns in the 19th century. But it has been deserted since the Second World War and is now in a ruinous state. 1332 John de Bradelegh paid tax in Crediton and may have been from this Bradleigh. He was paying 16s tax, which indicates that he was fairly well-off. Early 1500s: Bradleigh owned by Thomas Bradlegh. Mid-1500s: his grand-daughter married Peter Gorven, thus bringing the farm into the Gorwyn family. There was a court case about Bradleigh which pitted Alice and Peter against one of her Bradlegh cousins who tried to claim the property. The papers relating to the case describe how the property had belonged to Alice’s grandfather Thomas Bradlegh. Thomas’s estate was large – he owned ‘200 acres of [arable] land, 60 acres of pasture, 20 acres of meadow and 300 acres of furze and heath with appurtenances called Bradlegh’. 1635: an inquisition after the death of William Gorwyn recorded that he had been the owner and that his heir was his son John Gorwyn. 1752: John Gorwyn of Cheriton Bishop, described as a ‘husbandman’ and probably the John mentioned above, died and bequeathed Bradleigh to his second son John. It seems from the will that at the time Bradleigh was occupied by tenants called Caseley, as the will makes clear that John cannot take over Bradleigh until the death of ‘Richard Caseley’s widow’. The will also provided that if John married before Bradleigh became free, he should have the leasehold of Bowden instead. It is not clear what actually happened. 1721: another John Gorwyn (perhaps the son of the earlier one) seems to have been living at Bradleigh. The farm then passed to his eldest son and then that son’s eldest son, both called John. 1824: The last of this run of John Gorwyns was a bachelor, and on his death the property went to his cousin William Gorwyn (1780-1845) who promptly moved there from the much smaller neighbouring farm of Spirelake where he had been living. William’s descendants stayed there for three generations. c.1880: the last William Lambert Gorwyn of Bradleigh (1850-1928), who had only one daughter, moved away from Bradleigh. It is not clear what happened to Bradleigh, but it was probably sold fairly shortly thereafter, thus passing out of the Bradlegh/Gorwyn families after some 600 years. 1945: Bradleigh purchased by a local farmer, Leslie Pitts, whose mother was Jane Gorwyn of the Hittisleigh branch of the family. His descendants still own the farm. This estate of several hundred acres to the south of Crediton used to be known as the Great Park and was in medieval times the hunting park of the Bishops of Exeter. It was probably land that belonged in Saxon times to the Bishops of Crediton, and was retained when the bishopric was moved to Exeter. The bishops of Exeter were said as a result to enjoy “a fair palace to inhabit in, a fair park to sport in and a fair demesne to walk, thrive, feed and keep hospitality in”. It would have been largely forested and was well stocked with game, including red deer, with a keeper to keep out poachers – who appear to have been quite a problem, as a commission was appointed in 1313 to enquire into trespass in the park. Henry VIII did not confiscate the Great Park, but he pressured the then bishop of Exeter to sell it. By the early 1800s, it belonged the Tuckfield family, big Crediton landowners. 1810: the Tuckfields sold Crediton Parks for £13,000 to George Lambert Gorwyn of Spreyton (1763-1837). By this time, it consisted of some 287 acres; the timber had mostly been cut down; and the estate consisted of a number of tenanted agricultural smallholdings. 1837: George Lambert Gorwyn died and directed in his will that Crediton Parks should be sold to pay for their education and upkeep. 1838: his trustees sold it to James Wentworth Buller Esq. for £20,000. Hittisleigh was originally a tiny parish, but in the late 1800s a chunk of Drewsteignton was transferred to Hittisleigh to create the modern slightly larger parish. Most of the parish belonged to the Manor of Hittisleigh, although a small part of it was in the manor of Lampford. Drewsteignton was divided between a number of manors. Those in which properties associated with the Lambert Gorwyns were situated were the manor of Coombhall, owned by the Fulfords; and the manor of Fursham, which had a number of owners. First recorded mention in the early1200s, when Richard de Droscomb was given the liberty to cultivate a certain area of land, together with Budbrooke, upon condition of finding and carrying a bow and 3 arrows behind the King whenever he came to hunt on Dartmoor. It probably means the brook of Bucga (Bucga’s Ford is mentioned in the description of the boundary granted by King Aethelheard in 739 for building a Minster at Crediton). It was situated at Crockernwell, on the other side of the road from Lambert. At some point the property was divided into Higher and Lower Budbrook. The Lambert Gorwyn interest was in Higher Budbrook, which no longer exists (it seems to have been deserted when the wells gave out at the end of the 19th century). By the 1700s, the freehold of Higher Budbrook was probably held by the Risdon family of Spreyton. 1740: Richard Gorwyn (1693-1764) had a leasehold of Higher Budbrook, although it is not clear whether he ever lived there. From him the leasehold passed to his son John Lambert alias Gorwyn (1720-1765), who lived at Lambert. 1765: on John’s death, the property appears to have gone to his second son Richard Lambert Gorwyn (1748-1791). But he died young and it then went to his elder brother, another John Lambert Gorwyn (1746-1823) who lived at Lambert. 1800: John purchased the freehold from the Hole family (who had inherited the Risdons’ estate). c. 1820: John appears to have rented out Higher Budbrooke to his youngest brother George Lambert Gorwyn of Spreyton (1763-1837), as George is recorded as taking an apprentice for Higher Budbrooke in 1820. George appears to have farmed the land and used the house to accommodate one of his workers. 1823: John Lambert Gorwyn junior died, leaving the freehold of Higher Budbrooke to his nephew John Lambert Arden Gorwyn (1803-1877). He also rented out the farm and lived elsewhere. early 1840s: John Lambert Arden Gorwyn sold Higher Budbrook to his cousin Richard Lambert Gorwyn (1819-1861). Richard moved into the house sometime in the 1840s (when it was described as a farm of some 50 acres, so quite small). Richard ran into money problems and sold it in about 1850. There is no record of who the new owner was, but it was presumably a neighbouring farmer who used the house for his workers. The house was demolished probably in the early 20th century when the local wells began to run dry. It probably took its name from a mediaeval owner called Davy or David. Always a small farm (36 acres in 1842). By 1785 it appears to have passed into the ownership of the Cann family of Spreyton. 1881 or earlier: in the hands of William Lambert Gorwyn (1844-1916), although whether as a leasehold or freehold property at that stage is not clear. He was described as a farmer of 60 acres, so probably some land had been added to it. William was the son of George Lambert Gorwyn (1784-1862) who had been rented the neighbouring farm of Medlake, and Daviland had presumably been acquired for him so that he had a farm of his own. 1891 or aerlier: William moved to neighbouring Medlake, although it seems that he still owned the property, as it was later inherited by his son John. William used the house at Davyland to house a farmworker. 1901: Davyland let to Samuel Beer, who described himself in the 1901 census as a gentleman farmer. 1920s: William Lambert Gorwyn’s son John Lambert Gorwyn had taken it back. It was one of the last farms to be worked by a member of the family. Also spelt Furzedown, Furzedon. Presumably called after a hill covered in gorse. A good sized farm (160 acres in 1842). In the 18th century it appears to have belonged to a member of the Cann family of Spreyton, and was let out. 1804: George Cann of Falkedon in Spreyton bequeathed this and many other properties to his nephew George Lambert Gorwyn of Spreyton (1763-1837). 1837: George Lambert Gorwyn in turn bequeathed Fursdon to his grandson Richard Lambert Gorwyn(1820-1861), along with a lot of other property in Drewsteignton and Hittisleigh. Richard was an absentee landlord, letting Fursdon out to tenants. 1871: The freehold of Fursdon, together with a field called Round Ball Brake, was put up for sale in 1871 or 1872 by Richard Lambert Gorwyn’s heirs. GRAYSTONE, parish of Drewsteignton, Manor of Coombhall. Also known as Lower Honiford. Right next door to the farm of Honeyford. Both were small farms; together they made up about 110 acres. It was part of the Manor of Coombhall that belonged to the Fulfords of Great Fulford. The last tenants of Graystone under the Fulfords was Josias Steven or Stevens, who was there from at least 1742 to his death probably in the 1790s. Stevens was paying an annual rent of 13s 6d; a heriot of his “best beast” or £3.6s.8d was also payable. 1789: Mary seems to have given the property to her youngest son, George Lambert Gorwyn of Spreyton (1763-1873), as his marriage settlement of 1789 includes provision for an annuity of £35 for his widow, to be paid out of the revenues of Graystone. After Josias Stevens’ death, George seems to have let the farm to William Ponsford, as the latter is recorded as taking an apprentice for Graystone in 1798. But later on George appears to have farmed the land himself, as in 1816 he took an apprentice for the farm. 1837: George Lambert Gorwyn died, bequeathing Graystone (and other farms including Honeyford) to his grandson Richard Lambert Gorwyn (1820-1861). The latter was an absentee landlord and Graystone and Honeyford were both let during his tenure. 1840 (or earlier): George Gorwyn of Medland, a remote cousin of Richard, was the tenant. George put his son John Gorwyn (1813-after 1890) into Graystone. By 1850, John had moved to the larger farm of Gorwyn in Cheriton Bishop and Honeyford was let to other tenants. 1871 or 1872: the farm was sold by Richard’s heirs to the Strong family, along with Honeyford. The house burnt down immediately after the sale and was replaced by the current Victorian structure. A small and ancient cob and thatch farmhouse dating back to medieval times – there are now three layers of thatch, the second layer to allow for the building of chimney breasts probably in the 16th century. It also had a cob and thatch barn, larger than the house, that has now virtually disappeared (in 1791 it was described as a farmhouse, barn, shippen, small garden and curtilege and 42 acres). It was part of the Manor of Coombhall that belonged to the Fulfords, and was probably always small and mostly farmed by its tenants in conjunction with another farm like neighbouring Graystone. 1730 it was being rented by the Gorwyn/Lambert Gorwyn family of Cheriton Bishop. The first tenant was Elizabeth Gorwyn, the widow of William Gorwyn of Lambert in Cheriton Bishop, who seems to have moved there as she died there in 1733. 1737: Richard Gorwyn (1693-1764) was renting it at an annual rent of 13s. 4d. and one capon at Christmas. The leasehold then passed to his son John Lambert Gorwyn (1719-1765), and after his death, it went to his widow Mary. 1771: the Fulfords gave a new 99-year lease to John’s second son Richard Lambert Gorwyn at the same rent, for an upfront payment of £40. But he died young in 1791, and the leasehold seems then to have reverted to his mother Mary. She passed it to her youngest son George Lambert Gorwyn (1763-1837), who paid the Fulfords an annual rack rent of £36. 1800: George Lambert Gorwyn purchased the freehold from the Fulfords. He farmed the property himself but he lived at Spreyton and there were farmworkers in the house, sometimes more than one family. 1837: George died, he leaving Honeyford and Graystone (and other property) to his grandson Richard Lambert Gorwyn (1820-1861). Richard rented the farm out. 1841 (or earlier): the tenant was Richard’s remote cousin George Gorwyn (1784-1862) from the branch of the family that lived at Bradleigh in Crediton. George Gorwyn also rented neighbouring Graystone, where he lived, and again the house was inhabited by farm labourers. 1871 or 1872: Honeyford and Graystone were put up for auction by Richard Lambert Gorwyn’s heirs. Also called Heywood or Howard Barton (a barton is usually a large farm). The farmhouse has a 16th century core but was rebuilt in the 17th century. It was a good-sized farm (182 acres in 1842), especially for a small and poor parish like Hittisleigh. By the late 1700s, the farm appears to have become the property and residence of, William Cann, a younger son of the Cann family of Fuidge in Spreyton. 1801: William Cann died, leaving Howard to his brother George Cann of Falkedon in Spreyton. 1804: George Cann died from a fall from his horse while riding at Howard (he was 74 at the time of his death). He bequeathed Howard to his nephew George Lambert Gorwyn (1763-1837). George appears to have farmed Howard and to have used the house for farmworkers. 1837: George Lambert Gorwyn died leaving Howard (and a lot of other property) to his grandson Richard Lambert Gorwyn (1820-1861). He also left an annuity of £26 to his daughter-in-law Mary, Richard’s mother, payable out of the revenues from Howard. During Richard’s tenure, Howard was let out. 1871 or 1872: the property was put up for auction. “Howard otherwise Heywood” was part of a single lot with Teignholt and Teignholt Ford, described in the bill of sale as consisting of 223 acres with a convenient farmhouse and four labourer’s cottages. The estate was still encumbered by the £26 annuity payable to Mary Lambert Gorwyn, Richard’s mother, who died only in 1875. First recorded mention in 1238. “Med” is meadow; “lake” comes from the old English lacu, stream or watercourse. So it means ‘meadow streamlet’. A smallish farm; in 1842 it was 95 acres. It was part of the big Manor of Lampford that belonged to the Fulford family of Great Fulford in Dunsford and would have been a tenanted farm. In 1768, they sold Medlake to help pay off debts. 1866 (or earlier) George’s son John Lambert Gorwyn (1813-after 1890) moved there with his family. When he died it was taken over by his son William Lambert-Gorwyn (c.1874-1919), who farmed it together with neighbouring Davyland. William’s son John Lambert-Gorwyn (1885-1956) was the last of the Lambert-Gorwyn family to farm there. The Drewsteignton lime quarries were already being worked in the 17th century, lime being used both for building and as a fertiliser. The quarries were part of the estate of Carew family who owned the manor of Drewsteignton. 1772: the Carews leased the quarries and their kilns (the lime had to be burnt before use as a fertiliser) to a consortium consisting of two members of the Cann family and William Ponsford of Ford in Drewsteignton. The two Canns squeezed out William Ponsford’s son when his father died and acquired the freehold for themselves. They brought in a third member of the family and developed the quarries into a highly profitable business, benefitting from an increased demand for lime as a fertiliser. The quarries employed a significant number of people, and a “kiln village” of cottages grew up, all owned by the three Canns. 1804: one of the three Canns, George Cann, bequeathed his one third share to his nephew George Lambert Gorwyn (1763-1837). It was a valuable asset, and the profits from the quarries no doubt helped pay for George’s substantial land purchases (in 1837, George’s share of the profits was £300). 1837: George died, bequeathing his share in the quarries to his grandson Richard Lambert Gorwyn (1820-1821). By the mid-19th century, however, the demand for local lime began to fall as the newly built railways began to bring cheaper lime in from elsewhere, and the quarries were no longer so profitable. Flooding also caused problems. The quarries were still bringing in some revenue, however, when Richard’s family sold his share after his death, and they did not finally close until the early 20th century. 1871: Richard’s heirs put the property up for auction. At the time of the sale, the property was described as consisting of 50 acres with lime works, kilns, plants and machinery, and 11 labourer’s cottages. The bill of sale added that “the lime produced at the kilns is of such quality as not to be surpassed”. A substantial 4-5 bay farmhouse now divided into 3 cottages. A good-sized farm (146 acres in 1812). By the 1700s it belonged to the Fulfords of Great Fulford. In the 1660s and 1670s, the tenant was Thomas Hall, one of the Drewsteignton bigwigs of the time. He demolished one of the six chimneys to avoid hearth-tax (so it was obviously a big house). In 1742 the tenant was Robert Tapson, probably the stepson of Thomas Hall. In 1765, the Fulfords gave a 99-year lease to Thomas Moon or Mohun, yeoman of Drewsteignton, for an upfront payment of £100 and an annual rent of £1.11s. plus best beast or £4 as herriot. 1776 (or earlier) a leasehold of Narracott had been taken over by the Lambert Gorwyn family of Cheriton Bishop, as in the 1777 list of Drewsteignton churchwardens William Lambert Gorwyn (1750-1797) is described as being “of Wallon and Narracott”. 1802: William’s brother George Lambert Gorwyn (later of Spreyton, 1763-1837) was living there (he moved to Spreyton two years later). 1814: the Fulfords made a deal with William Strong, a prosperous local yeoman farmer, under which they exchanged Narracott for properties that William Strong owned in Tedburn St Mary. His descendants still own the property. In Drewsteignton until the boundary change, and then in Hittisleigh. Holt means wood, so ‘wood of the Teign’. A very small farm (40 acres in 1841). By 1786 the owner was William Cann who lived at the nearby farm of Howard. 1801: William Cann bequeathed “Teignholt Fords and Little Teignholt (otherwise Lower Teignholt)” to his brother George Cann of Falkedon in Spreyton. 1804: George Cann died, leaving the property to his nephew George Lambert Gorwyn of Spreyton (1763-1837). 1837: the property was inherited by George’s grandson Richard Lambert Gorwyn (1820-1861), an absentee landlord. 1871 or 1872: Richard’s heirs sold the property. Trayhill was a very small farm (38 acres in 1834) next to Westwood and was almost certainly part of the Manor of Drewsteignton belonging to the Carew family. Nothing remains of it now but a barn. 1788 the heir of the Carews leased it to George Cann of Spreyton, who probably then purchased it, as by 1834 it was in the ownership of George Lambert Gorwyn of Falkedon (1763-1837) who was George Cann’s heir. 1837: George Lambert Gorwyn left Trayhill to his grandson, another George Lambert Gorwyn (1818-1885). This George first let the property, but then took over the house for his own use and lived in it for many years. He was recorded in the 1861 census as living there with a housekeeper and domestic servant; by the 1871 he had married his domestic servant and was living there with her and their son George Lambert, the future MP and 1st Viscount Lambert. c.1880: George Lambert Gorwyn was a quarrelsome man, much disliked by his neighbours. In about 1880, a man called Davies who had a grudge against him came to the Trayhill with a friend and set fire to a woodrick. The fire spread to the house and other buildings which where destroyed, leaving only the barn. Old people in Hittisleigh could still remember in the 1950s how George Lambert Gorwyn was “burnt out” of Trayhill. The house was never rebuilt, and Trayhill effectively became part of the neighbouring farm of Westwood. 1920: George Lambert Gorwyn’s son, George Lambert MP (1866-1958), sold Westwood and Trayhill to Eliza Endacott. First recorded in 1249. Meaning: place with walls. A largish and ancient farmhouse and a reasonable sized farm (113 acres in 1842), tucked away in a remote valley near Dartmoor. In the early 1600s it was owned by the Coleridge family (possibly by a direct ancestor of the poet Samuel Taylor Coleridge). 1730s or 1740s: possibly purchased by Richard Gorwyn, the heir to Lambert (which was let out at the time), as he is listed as a freeholder in Drewsteignton at that time, and the other properties that he was associated with in Drewsteignton were leasehold ones. 1776 (or earlier) it was in the ownership of Mary Lambert, the widow of Richard’s son John Lambert alias Gorwyn of Lambert (1719-1765). Mary gave it to her son William Lambert Gorwyn (1750-1797), who lived and farmed there until his death in a drowning accident. 1797: inherited by William’s son, another William Lambert Gorwyn (1780-1853), who also lived there until his death. 1853: William left Wallon to his eldest son William, who was a solicitor in Exeter, entailed on the younger William’s son, with instructions it was not to be let for more than 21 years at a time – presumably because he holed that his grandson would want to come back to farming. But his grandson also became a solicitor. He kept on the property, until the entail ran out, letting it to a farmer called John Strong whose wife was a Lambert Gorwyn. A medium sized farm (107 acres in 1834) with an ancient farmhouse of cob and thatch. 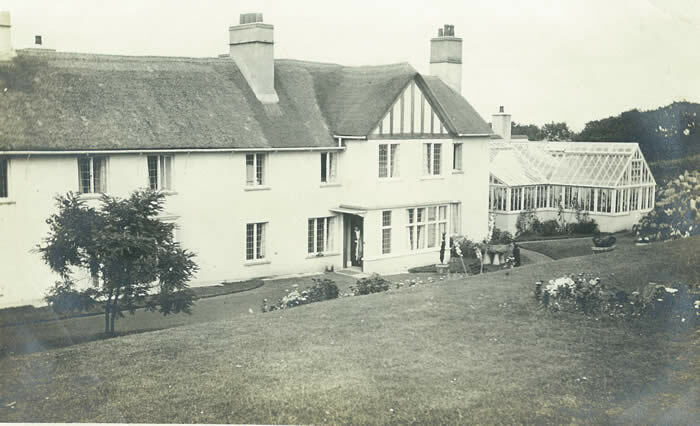 Westwood was part of the Manor of Drewsteignton, which was owned for many generations by the Carew family. Timber from its woodland is said to have been used to build the ships that fought in the Armada. By the 1740s, the heir of the Carews was letting out the property for a rent of 17s. 4d, plus 2 capons at Michaelmas, reserving for himself the rights to the timber, hunting, hawking, fishing and fowling and to all minerals, including specifically blue slate, healing stones and limestones. This lease appears then to have sold to William Cann of Howard in Hittisleigh. William Cann died, leaving Westwood to his brother George Cann of Falkedon in Spreyton. 1804: George Cann died in turn, leaving his property, including the leasehold of Westwood, to his nephew George Lambert Gorwyn of Spreyton (1763-1837). George Lambert Gorwyn subsequently acquired the freehold. However, he never lived there. 1837: George lambert Gorwyn died and Westwood went to his grandson, another George Lambert Gorwyn (1818-1885). 1885: on his death it went to his son, George Lambert (1866-1858), later the MP for South Molton. He also rented out the property. 1921, the then tenant Eliza Endacott purchased the freehold of both Westwood and Trayhill from George Lambert MP for £1,700. 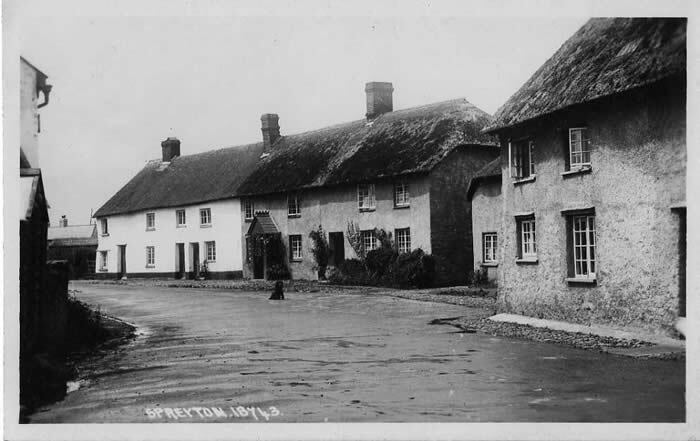 The village of Spreyton was a single manor, already in existence at the time of the Domesday Book. The Manor passed through various hands in the Middle Ages. By the 15th century it belonged to the Talbot family. They ran out of male heirs and the manor was split between two Talbot co-heiresses. One married into the Kelly family (who were also owners of the Manor of Eggbeer). The descendants of the Kellys sold their half-share share in 1639 to William Battishill, a Spreyton yeoman. The other half-share seems to have been split into two quarters, which were acquired by other families, so many farms in Spreyton ended up being owned in shares by several people. The other big yeoman family in Spreyton was the Cann family of Fuidge, and they gradually acquired many of the farms belonging to the old Manor. Through George Cann (1730-1804) whose sister married a Lambert Gorwyn, several of these farms came into the Lambert Gorwyn family. In the 1600s and early 1700s “Coffin” seems to have been the more usual form of the name. It then became “Coffins”. When George Lambert MP married in 1904 and brought his bride back to Coffins, she did not like the funereal associations of the name and thereafter it has usually been spelt “Cofyns” or “Coffyns”. The etymology is uncertain. But there is a large and ancient Devon family called Coffin, and it may be that a Coffin once lived there (there is or was for instance a Coffins associated with the Coffin family). By the 1700s, it belonged to the Hore family to whom there are memorials in Spreyton church. Before then, its ownership had been divided between several landowners. It was a large farm. In 1655, it was described as “1 messuage [i.e. dwelling]; 1 kitchen; 1 stable; 1 barn; 1 curtilege and garden and orchard; 20 acres of land [i.e. arable land]; 14 acres of meadow; 20 acres of pasture; and 80 acres of furze and heath” – i.e. a total of 134 acres. At the beginning of the 19th century, it was about 176 acres. In the early 1900s, George Lambert MP purchased some neighbouring fields and also attached some fields to Coffins that previously formed part of neighbouring farms that he owned, so that by the 1950s its area was 226 acres. late 1700s: a descendant of the Hores sold Coffins to George Cann of Falkedon, probably in two stages, the first half in the 1790s; and the second half in 1803 (each for £600). 1804: George Cann died. He was a bachelor, and he made his sister’s son George Lambert Gorwyn (1763-1837) his heir. But probably because he made his will before the purchase of the second half of the freehold, one half passed by the law of intestacy to his brother John Cann of Fuidge, from whom George Lambert Gorwyn purchased it in 1808, again for £600. The various bits of the freehold continued to be subject to various conditions and reservations imposed by previous owners when they sold them on. Thus the hunting and fowling rights continued to belong to the heirs of Richard Hole. It is not clear if the Lambert Gorwyns purchased the hunting rights from the Holes at a later stage, or if they were just forgotten about. The new owner, George Lambert Gorwyn, lived at the nearby farm of Falkedon and seems to have farmed the land at Coffins while letting the house. mid-1820s: George put his son, George Lambert Gorwyn (c.1786-1850) into Coffins. George junior’s unpopularity with his family’s tenants was such that one point the villagers turned him out of Coffins by force, dumping all his belongings at Spreyton Cross (from where the local blacksmith is alleged to have stolen his china). What happened to George junior next is not clear, but by the 1841 census the occupants of Coffins are listed as agricultural labourers. 1837: George Lambert Gorwyn senior died, passing over his unsatisfactory son, and leaving Coffins – along with several other farms – to his grandson, yet another George Lambert Gorwyn (1818-1885). This George lived for a time at Coffins, but then rented it and moved to Trayhill in Hittisleigh. 1881: after Trayhill was burnt down, George moved back to Coffins with his wife and two young children. 1885: George died, leaving his estate to his 19-year-old son George Lambert (the family had by this time dropped the Gorwyn). George Lambert (the future MP and 1st Viscount Lambert, 1866-1958) lived all his life at Coffins, although he also acquired a house in London near Parliament. In 1905, following his marriage, he completely revamped the house, building onto the old farmhouse a large new wing – i.e. what is now the front of the house. He also had the garden landscaped and a tennis court built, turning what was a fairly basic cob and thatch farmhouse into a gentleman’s residence, suitable to put up guests like Winston Churchill (who once stayed the night and to his hosts’ embarrassment was caught short in the night only to discover that the servant had forgotten to put a chamber-pot in his room). George’s eldest son, again yet another George Lambert, replaced his father as the local MP in 1945 and also lived at Coffins with his family. He retired abroad and handed over the house and estate to his son, the last of an unbroken line of six George Lamberts to own the property. 1970: tragically, young George died in a car accident, and in 1972 the estate was sold. Croft (usually pronounced “Cruft”) is a common place-name in Devon, and means “enclosure”. The Croft in Spreyton dates back to at least 1292. It is a small farm between Rugroad and Falkedon. The house at Croft is an old one probably dating back to medieval times and is mentioned in Pevsner’s “Buildings of England” as a former Devon long-house with good internal joinery. The lower end was converted into a kitchen in the 17th century, and its hearth incorporates a smoking chamber. Croft was probably part of the Manor of Spreyton, although it appears to have become a freehold fairly early on. It seems in early times to have formed a single property with Rugroad, as old deeds show that the owner of Croft and Rugroad had to pay an annual rent of a pair of gloves to the lord of the Manor of Spreyton. In 1765 George Cann of Falkedon purchased Croft. The deed of sale describes the farm as having only 70 acres. 1804: George Cann died, leaving most of his property, including Croft, to his sister’s son, George Lambert Gorwyn (1763-37). George appears to have farmed the land (he is recorded in parish documents as taking an apprentice for Croft in 1812), but he himself lived at Falkedon. 1837: George died, bequeathing Croft, along with his other properties in Spreyton, to his grandson, another George Lambert Gorwyn (1818-1885). This George also put tenants into Croft most of the time. He did, however, take refuge briefly at Croft after he was burnt out of Tray Hill (see above), and his daughter Mary was born there in 1881. 1885: George Lambert (as he had by then become) died, and the property passed to his son George Lambert (the family had by then dropped the Gorwyn), the future MP and 1st Viscount Lambert. The latter also let the farm. At the time of the 1891 census, one Samuel Powlesland was living in Croft with his wife and grandson. The latter was said to have been fathered by George Lambert Gorwyn senior, and no doubt Samuel and his family were put into Croft for that reason. When George Lambert died in 1958, the property went first to his son and then his grandson. Croft was sold in 1972 after the death of this grandson. First recorded in1270). It was a hamlet rather than a single farm; early deeds refer to Higher, Lower and Middle Falkedon. There seem to have been four different farms at some stage, as there are the remains of four farmyards. The ownership seems originally to have gone with that of the Manor of Spreyton, as the various parts were divided between a number of owners in the 1600s. By the 18th century, Middle and Lower Falkedon (between them making a large farm) had been acquired by the Cann family of Fuidge. This part included the only surviving big farmhouse, a handsome cob and thatch (now slate) longhouse. It seems to have been occupied by a younger branch of the Fuidge Canns. The 1795 will of William Cann, who lived at Howard in Hittisleigh, directs that his body be buried in Spreyton Church under Falkedon Pew in a coffin of good English oak with a double cover, and for his body to be conveyed in a bier from Howard to Falkedon, where his brother George was residing, and for it to be lodged there one night before his burial. 1804: George Cann bequeathed Falkedon to his nephew George Lambert Gorwyn (1763-1837), and George moved in there after George Cann’s death in 1804, remaining there for the rest of his life. 1837: George Lambert Gorwyn bequeathed Falkedon (along with other properties) to his grandson, another George Lambert Gorwyn (1818-1885). As the younger George was a minor when he inherited, and was living elsewhere, all his grandfather’s farm and household goods from Falkedon were auctioned (there is an account of the auction in the National Archives), and Falkedon itself was let to tenant farmers. The younger George never lived there and continued to rent it out, as did his son and heir George Lambert MP (later 1st Viscount Lambert, 1866-1958). When George Lambert’s son (also George Lambert, 1909-1989) inherited his father’s estate, he continued to live at what was by then the family home of Coffins, but took Falkedon in hand and lent the house to his younger brother Michael, who used it as a holiday home (Michael worked in London) and was the last member of the family to live there. It was sold along with the rest of the Lambert family estate in Spreyton in 1972. It may have been named after a Saxon owner called Hrugca, “Hrugca” becoming Rug-. The second element -rode probably came from a Germanic word meaning “clearing”, so it was “Hruga’s clearing”, and obviously very ancient in origin. 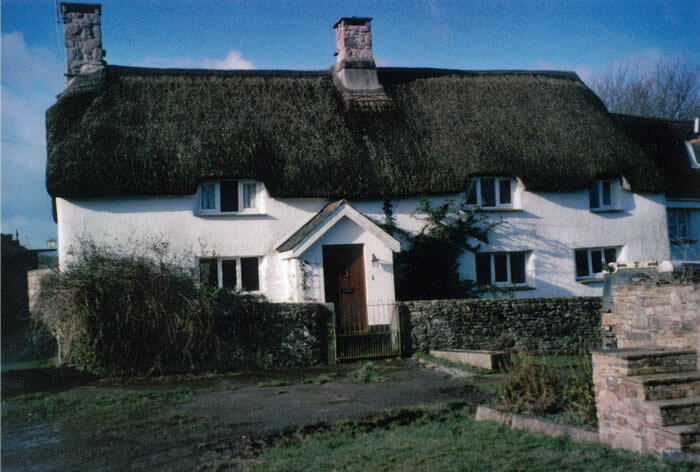 There must originally have been a traditional cob and thatch farmhouse, but this disappeared many years ago, to be replaced by the current house. The property seems to have been associated closely with the neighbouring farm of Croft (see above). In 1765 William Cann of Fuidge purchased Rugroad. 1801: William Cann bequeathed Rugroad to his brother George Cann, who lived at nearby at Falkedon. 1804: George Cann died, leaving his estate, including Rugroad, to his sister’s son George Lambert Gorwyn (1763-1837), from whom it descended to his grandson George Lambert Gorwyn (1818-1885); his great-grandson the MP George Lambert (1866-1958); his great grandson George Lambert (1909-1989) and his great-great-grandson who was killed in 1970. During most of this time Rugroad, a small farm of some 60 acres, was let. But as it adjoined Coffins, the main farm of the Lambert family, at various times it was farmed by the family, with the house being used to accommodate farmworkers. Rugroad was sold along with the rest of the Lambert family estate in 1972. Spreytonwood (sometimes spelt Spreyton Wood) is heavily wooded, as its name indicates, and these woodlands are almost certainly remnants of the forest that covered Devon several thousand years ago, before farmers began clearing the land. Its early history is uncertain. But it was probably part of the Manor of Spreyton. By the 19th century had come into the hands of the Hole family who had inherited part of the Manor. The Holes were rich clerics who owned a lot of land in Devon as well as the livings of a number of parishes. They never lived at Spreytonwood and probably always let the property for income. 1885: the then tenant seems to have died or disappeared, and the harvesting that year was done by the young farmer George Lambert (the future MP and 1st Viscount Lambert, 1866-1958) of the neighbouring farm of Coffins, presumably at the request of the Hole family. 1886: Robert Hole urged George Lambert to take a tenancy of the 313-acre property (it was described as two farms, of which the higher farm consisted of 129 acres of “very good land when in heart”). George was only 20 at the time and taking on Spreytonwood meant doubling the size of his land. George nevertheless agreed to take over Spreytonwood, although not before driving a hard bargain over the rent on account of the bad state of the property – he ended up paying £120 rather than the £145 originally demanded. George acquired the freehold in 1911. The original farmhouse had burnt down at some stage and the remains had been fitted up as a cottage, which was subsequently improved by George Lambert. He first farmed the land himself, letting the house, and then let the whole farm to tenants. The farm was sold along with the rest of the Lambert family estate in Spreyton in 1972 after the death of the last male heir. First recorded in 1327. The name, like the variants Wyke and Wick, comes from the old English “wic”, meaning a farm or dwelling. It is a fairly common farm name in Devon, and often denoted the house of the lord of the manor, so Week may have been an important dwelling in the past. Week entered into the possession of the Battishill family probably in 1639, and there are monuments to the Battishills of Week. 1913, after the death of the last of the Spreyton Battishills, his estate was sold and Week and neighbouring Woodhouse (a total of 326 acres with two cottages) was sold to a Mr Hannaford of Cheulmleigh. But it was purchased shortly thereafter by George Lambert MP (1866-1958). The story in his family is that he was keen to own Week as his mother or wife so enjoyed the view of the Week firs – the group of fir trees at the beginning of the drive to Week – from the garden at Coffins. Week remained in his possession until the 1950s, when it was sold to its then tenant.